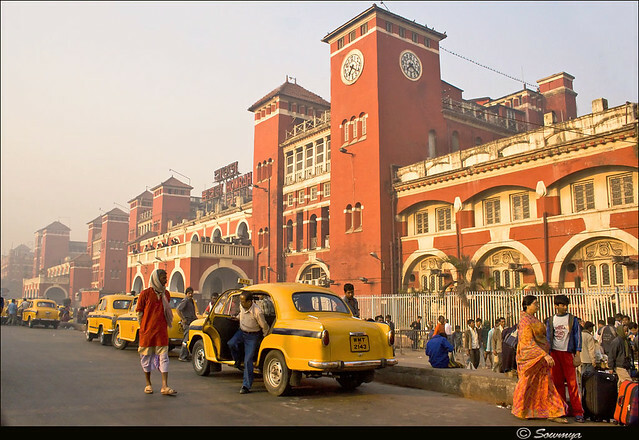 I was at Howrah, the main railway station of Kolkata or Calcutta as the city was known four years ago, before it was renamed in an effort to turn the name into something a little closer to its pre-colonial and traditional form. I was at Howrah and I was watching a couple of sinewy workers load big chicken baskets onto a carriage, waiting for the train that would take me up North, to Siliguri, where I would get a jeep to Darjeeling, my actual destination. The names of towns and of cities which – to a foreigner or “non-traveler” – mean nothing more than dots on a map or unorthodox piles of letters become very important in the view of the traveler. They become a kind of temporary identity. “Where are you going?” is what travelers ask each other. “Oh, from Delhi to Jaipur” or “I’m making my way to Kathmandu” and so on are the answers and while they may seem boasting or strange or fascinating to anybody sitting at home, for the traveler such answers are a kind of temporary home and give them some shaky sense of comfort. I had with me three apples, which I had bought the night before, a bottle of badly tasting clean water (water from the tap is undrinkable in India) and a bar of chocolate – some overly sweet British manufacture containing bits of nut and raisins – and my backpack. They appeared suddenly. Two brown skinned girls with matted hair, who somehow seemed like ghosts formed by the streets, because they had about themselves something grey and dusty. It covered everything – their faces, their hands, their clothes – everything except for their eyes for one looked at me with lively eyes and in the eyes of the other I saw nothing but tiredness, resignation and apathy. Two beggar girls. The two weren’t old enough to be aware of themselves as beggars, so they behaved very naturally around me, without any sign of neediness of deference. The girl with the lively eyes exuded energy and curiosity, the girl with the apathetic eyes didn’t even look at me properly. She held a bundle of sorts in her hands and she seemed tired, so tired that she could hardly stand upright, but sat down next to me and stared straight ahead into some private emptiness where none could follow her. The other girl grabbed hold of my sleeve and of my fingers and started to chatter happily. She didn’t beg. We started the exploratory kind of talk that happens between two people who speak and understand little of each others languages. Among other things I pointed out the scores of beaks that poked from the woven chicken baskets next to us, but she was more interested in my hands, so I started a game of “dancing hands” with her, making my fingers slip and fly from her grasp and dance in front of her eyes. This made her laugh and with an unsurprising lack of distance she started grabbing my arms. I know I asked her for her name, but now I am a little torn because I have forgotten her name and I do not want to invent a name for her – it would turn her into too much of a fiction. I held out one of the apples for her to take and was surprised. She didn’t want it. I had thought, arrogantly, that she was begging from me but she wasn’t, not at all and the arms crossed in front of her chest made this more than clear. In the end it was me who had to beg her to take the apple and to take another one for the apathetic girl who I thought to be her sister. The lively girl had to hold the apple right under her sister’s nose and hold it there for a while until the girl reacted. She didn’t react too pleased, either. She sniffed disapprovingly and waved her sister’s hand away. She didn’t want to be disturbed. She held on to her bundle tightly and lay down on the floor, resting her head on my knee. Where her head touched me I imagined that I could feel all the cold and all the tiredness that was inside of her small body. I could feel just how cold she was, just how weak and how much she needed the rest. For a moment I began to wonder how it could be that one girl was so weak and the other so energetic and I thought, strangely, that the lively girl was somehow taking all the strength from her sister. This filled me with a small, irrational anger for her. Accordingly, the lively girl reacted angrily, put down the apple and cursed her supposed sister and then turned back to me, smiling. She inspected her own apple carefully, found a spot where the apple was spoiled and said, “Uncle, uncle, look.” and pointed it out to me. I said something apologetic and she shrugged her shoulders, bit the spoiled spot out of the apple and spat it on the railway tracks. I tried to get the other girl to eat her apple, but she kept waving my hand away. Her movements caused the cloth that was wrapped around her bundle to slip and suddenly I saw that she held a little brown-greyish baby in her hands. I looked at the baby for a moment, searching for signs of life in its immobile face, uncertain what to feel. Only then, as if the discovery of the baby was necessary to wake her from her slumber, the apathetic girl came alive. She sat up and moaned for a while until her sister, unwillingly, took the baby-bundle. She started to eat her apple and I began to feel quite glad…glad that she was cautiously enjoying her apple, glad also that the baby they had was alive. I hear a voice over the loudspeaker calling out my train. It would leave in ten minutes. I realized I had to leave the girls. Looking through my pockets I found that I only had twenty rupees left. The lively girl had returned the baby to her sister, who held on to it in a way that made it impossible for me to say what she thought. Was this her little brother or sister? Was it her own child? (Couldn’t be – she wasn’t older than ten…those were children who had been sent to beg or who came here because they knew they sometimes got something to eat here.) Did she try to give warmth to the child or did she hold onto it because the child warmed her? I let the thought go and gave the lively girl the money – I had two notes and I pointed at her and then at her sister. For both of you. She grabbed both and turned stubborn so for a few moments we had a little quarrel. While quarrelling I realized that it wasn’t about the money for her (maybe that is obvious, but India and money are an easy cause for paranoia among visitors to this country) but that it was about dominance. She was the older, she was the stronger. She would never give something willingly to her sister who was weak. But I, stranger or not, was still a grown up and in the end she gave in, crumpled up the note and threw it at her sister (by then I was pretty sure that they were indeed sisters). I had nothing else to give to the girls and only the fact that my train was leaving in ten, no, five minutes, kept me from feeling more guilt and responsibility than I did. I took my bags, said my goodbye to the weak girl, trying to put as much, sadly ineffectual, kindness into it as I could and went to the train. Her sister came along. She hopped and danced around me, displayed once more all the life and strength that her sister lacked, and asked me to buy her something from one of the stands. She felt so much like a child that I had adopted for a couple of minutes and not longer. I told her, with some leftover anger at the way she treated her sister, that she had all my money and that she could buy something for herself. When I was about to enter the train (and the train, with all its controllers and wardens is taboo for beggars and street kids, unless they are selling something), her quick eyes spotted the chocolate in my bag. I broke it in half, asked her to give something to her sister, said goodbye and stepped on the train.